It almost a truism that cultural and organizational factors — these include politics, information silos, “tribal” interests, and effective change management — generally determine the success or failure of a major IT initiative in most organizations today. While “big bang” strategic projects and infrastructure upgrades are notoriously fraught with peril, particularly when it comes to creating real bottom-line business impact, there are few IT subjects that hit upon the issues above more directly than the practice of service-oriented architecture (SOA). Theories abound to why this is. One reason is that SOA’s vision of enterprise-wide interoperability, open data sharing, and a pliable strategic business architecture is often at odds with the present state of the business. The future state of a SOA vision is frequently misaligned with current stakeholder motivations and existing technology portfolios. In other cases it’s simply that technology change moves at light speed compared to the seemingly glacial pace of local business culture and organizational evolution. Maybe, as is sometime prescribed, getting people to look at their business in a fundamentally different way is the key. But this then makes SOA success a “soft” skill at which IT is notoriously poor. 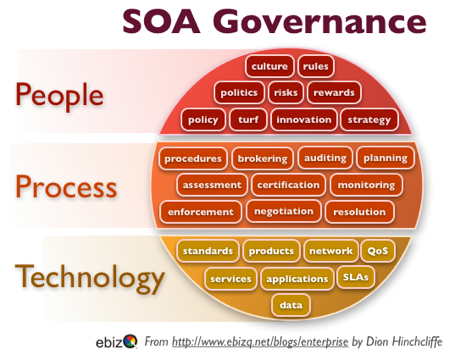 What then is to be done when it comes to achieving SOA adoption and driving successful governance long-term? These days the conventional wisdom of the SOA community has generally arrived at the conclusion that the concepts themselves are sound, but the way we go about realizing them is frequently “off” somehow. The stark fact is that too many large SOA initiatives often crash and burn (an astonishing 80% of them still fail to meet expectations or fail completely.) At the same time, most IT departments are simultaneously struggling with a constellation of lower level yet closely related concerns that often lack strategic context without SOA. These include APM, data center modernization, virtualization, workflow management, and IT governance to name just a few. What’s become clear is that the different human perspectives that each and every stakeholder within IT and the business brings to the table forms a constellation of competing concerns and goals which poses serious obstacles to realizing serious enterprise-wide IT efforts of any kind. This conflict appears particularly true of SOA because it cuts such a cross-boundary swath across an organization. Tribal parochialism can be a real threat to the ongoing health of a business as it attempts to evolve to address the realities of the 21st century business climate. It also makes SOA governance ultimately unlikely to make much headway, putting initial progress with SOA in long-term doubt.